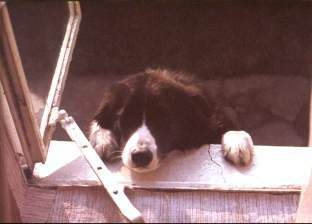 Old Tudor, our first collie, had the run of the town, which was just as well because short of tying him up there was no way to stop him roaming. I've seen him clear a six foot fence with ease and even higher obstacles were surmounted by a combined jump-and-scrabble technique. He never got into trouble, except for fighting against the local strongdog, a huge and mean labrador. Tudor generally lost those fights but that never stopped him from trying again. Tudor knew that he wasn't allowed outside and every time he met us around the block he did the unthinkable - he DISOBEYED AN ORDER. Rather than come to us he would pretend that he couldn't see, slink around us and take off for home. When we got there he would greet us enthusiastically. We, of course, could not tell him off for fear of stopping him returning altogether. Sometimes I have the sneaking suspicion that the dog had sussed us out better than we had him. One fine Tuesday Tudor didn't return from his expedition. We cruised through the town in our car, whistled and called but no black and white collie was to be found. Meg made enquiries from everyone she knew - which is nearly everyone - and the best that could be established was that Tudor had last been seen near the cattle market. Tuesday is market day in town and the lower end of Main Street is usually crowded with tough looking farmers wearing gum boots and sporting a walk that is only acquired by walking for years over well-fertilized ground cover. One person thought that she had seen the dog in the back of a farmer's car. This explained everything. 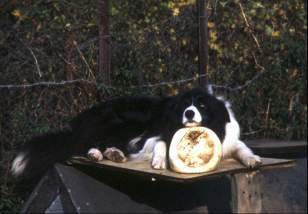 Tudor was a large and very good looking border collie. Farmers had often stopped me and asked: "Hey Sir, will you sell us your doog?" This particular farmer had obviously not bothered to ask. We put a notice offering a reward into the local newspaper that very day. This was a very effective strategy, because during the next few days practically every black and white animal that could be found in the neighbourhood and looked vaguely like a dog, was dragged to our doorstep. But none of them was our friend Tudor. After four or five days we gave up hope. The poor dog must be somewhere in a cold and dark shed - it was winter time - frightened and not knowing where he was. Nevertheless, every evening we went out and whistled for him, just in case. On the fifth day we went to bed late after having spent the evening talking about the dog, and at three hours after midnight we were wakened by a funny little cry from the outside. Both of us shot out of bed and looked out the window - there was Tudor, wagging his tail and making peculiar noises.